A Toyz in GTA III. The Toyz (spelled "TOYZ" in GTA III) is a van in featured in Grand Theft Auto III and Grand Theft Auto: Liberty City Stories. The Toyz is a depicted as a hobbyist van that contains remote-controlled cars and explosives. The van is identical to the Pony, but has flat side panels with "TOYZ'N THE'HOOD" logos, similar to the Panlantic. The van is dark blue in Grand Theft Auto III, and white in Grand Theft Auto: Liberty City Stories. Performance wise, the van also performs identically to the Pony and Panlactic, being generally mediocre in top speed and acceleration, sluggish with its steering and braking, moderately weighted, and unstable for being top-heavy. When found and entered, the Toyz starts a mission where the player uses remote control cars in order to destroy people and property, rampage style; in GTA Liberty City Stories, an RC checkpoint races are also available from the van. Players can obtain the van with starting the any RC missions by pushing the van forward about two car lengths. A Toyz in GTA III (Rear quarter view). The TOYZ'N THE'HOOD logo on GTA III's Toyz. The TOYZ IN DA HOOD words on GTA Advance's Belly. A Toyz in GTA Liberty City Stories (Rear quarter view). The van's logo name is a pun of Boyz N the Hood, a 1991 film. The van's bodywork in GTA III noticeably lacks the Gouraud shading necessary to smooth out polygon edges on a vehicle model. As a result, the van's body appears more jagged and blockier than the Pony and Panlantic upon close inspection. This problem does not appear to affect the van's removable parts such as the bumpers, quarter panels and doors. Near Rothwell Station in Hepburn Heights, Portland. Starts Diablo Destruction. In an alleyway one block south of demolished building in Saint Mark's, Portland (starts Mafia Massacre). Opposite Kenji's Casino in Torrington, Staunton Island. Starts Casino Calamity. North of hideout in Wichita Gardens, Shoreside Vale. Starts Rumpo Rampage. At the construction site in Hepburn Heights, Portland (starts Thrashin' RC). Two blocks south of Punk Noodles in Chinatown, Portland. Starts RC Triad Take-Down. Near the boat house in Belleville Park, Staunton Island. Starts Ragin' RC. South of the terminal inside Francis International Airport, Shoreside Vale. Starts Chasin' RC. Love Wagon, GTA 1 equivalent. Top Fun, GTA Vice City equivalent. 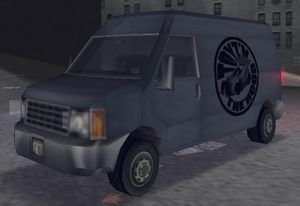 Berkley's RC Van, GTA San Andreas equivalent.